Rotary dryers potentially represent the oldest continuous and undoubtedly the most common high volume dryer used in industry, and it has evolved more adaptations of the technology than any other dryer classification. It could be used in iron ore beneficiation, gold ore beneficiation, ect. 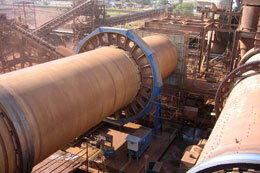 Rotary dryers are a class of dryer commonly used in industry to dry particulate solids. They are made of a long cylindrical shell that is rotated. 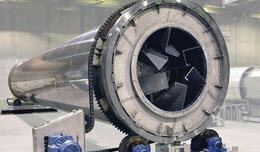 The shell is usually slightly inclined to the horizontal to induce solids flow from one end of the dryer to the other. In direct heat rotary dryers, a hot gas flowing through the dryer provides the heat required for vaporization of the water. To promote gas-solid contact, most direct heat dryers have flights, placed parallel along the length of the shell, which lift solids and make them rain across the dryer section. The transport of solids through the drum takes place by the action of the solids cascading from the flights, each cascade comprising the cycle of lifting on a flight and falling through the air stream. Thus, good flight design is essential to promote the gas-solid contact that is required for rapid and homogeneous drying. Fluid bed dryers are found throughout all industries, from heavy mining through food, fine chemicals and pharmaceuticals. They provide an effective method of drying relatively freeflowing particles with a reasonably narrow particle size distribution. In general, fluid bed dryers operate on a through-the-bed flow pattern with the gas passing through the product perpendicular to the direction of travel. In a radio frequency drying system, the RF generator creates an alternating electric field between two electrodes. The material to be dried is conveyed between the electrodes, where the alternating energy causes polar molecules in the water to continuously re-orient themselves to face opposite poles—much in the same way magnets move in an alternating magnetic field. The friction of this movement causes the water in the material to rapidly heat throughout the material’s entire mass.